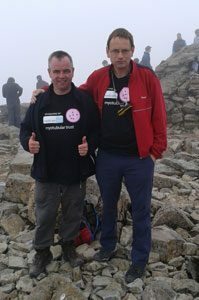 On 14th July, David Owen and James Davis completed the Three Peaks Challenge in support of the Trust. David and James undertook the gruelling challenge in recognition of their friend’s 2 year old son, Elijah, who has myotubular myopathy. David told us,’We finished the 3 peaks in 22 hours 20 minutes having never done any mountain walking before. I found it difficult and my legs are just starting to recover today (19th July) – its not painful to walk! We would like to congratulate David and James on their achievement and for their fundraising too – thank you! PreviousOur First Devon Hope Walk in 2012 Was A Super Day! NextGood Luck John and Mark!